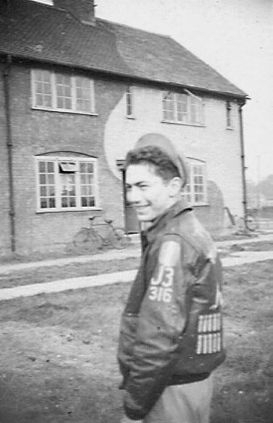 2Lt Kermit Wagner’s crew joined the 458th BG on June 5, 1944, the day before D-Day. 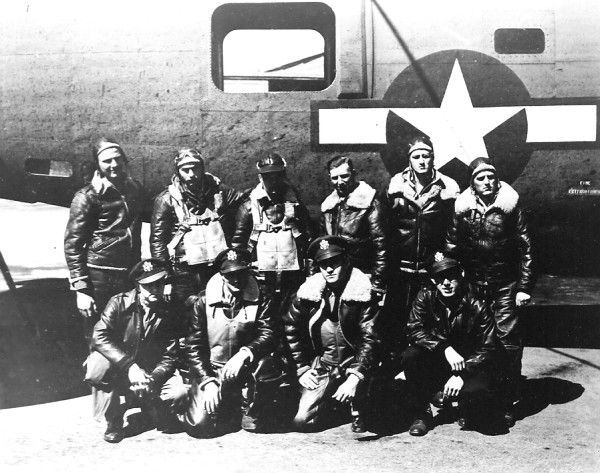 They were assigned to the 755th Squadron. 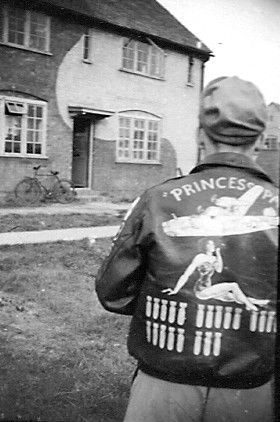 For reasons unknown, their co-pilot, Lt Wade Jones, did not arrive at Horsham until June 12th, the date that the crew flew their first combat mission to Evreaux, France. Over the next two weeks the 458th were involved in hitting various targets in France in order to aid the invasion forces, and Wagner’s crew flew five of these missions in June. During July and August Wagner and crew flew 17 missions. 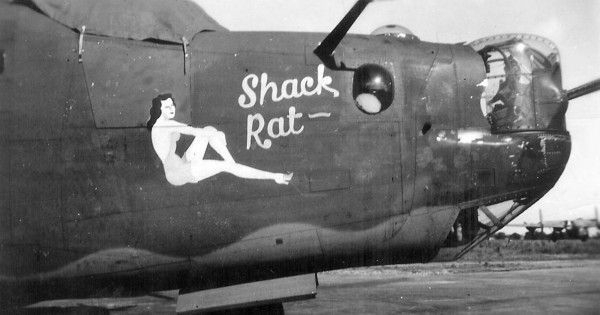 On the July 16th raid on Saarbrucken, Wagner aided with forming the group by piloting the 458th’s assembly ship “Spotted Ape” with Major Jamison, the 755th Squadron CO. The crew flew two combat missions in early September before the 458th was removed from combat operations and assigned to ferry gasoline to General Patton’s Third Army in France. A variety of “war weary” Liberators was used for this purpose and came from several different groups. The B-24’s were modified to carry gasoline in special bomb bay tanks, wing tanks, and also in five gallon cans. The aircraft would leave Horsham singly, fly to newly captured airfields in Clastres and Lille France, unload their gasoline and return to Horsham. From September 12 through the end of the month the 458th devoted 13 days to these “Truckin’ Missions”. Crews received no mission credit, although some of these flights, loaded with thousands of pounds of gasoline were more dangerous than some combat missions. The group lost two crews – one due to a crash on takeoff, and one was shot down returning from France when they strayed too far over German lines. Wagner’s crew flew eight of these days, their last on September 22nd when they crashed while landing in France. After September, records indicate that 1Lt Wagner was moved to a Squadron HQ position. He is not listed as flying any missions in October, but reappears in November as a command pilot, flying lead missions. 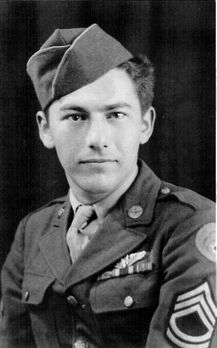 The remaining men on the crew were transferred to the 752nd Squadron on October 23rd with 1Lt Leroy E. McGough as their new pilot. McGough had arrived at the 458th as a co-pilot with Lt James J. Boyle Jr’s crew on June 6, 1944 – one day after Wagner. 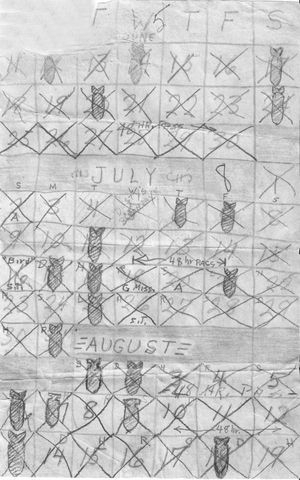 T/Sgt Lewis Roberts (RO) logbook entries and the mission record of Lt McGough seem to point to the fact that the crew’s missions in October and November were under Lt McGough’s leadership. 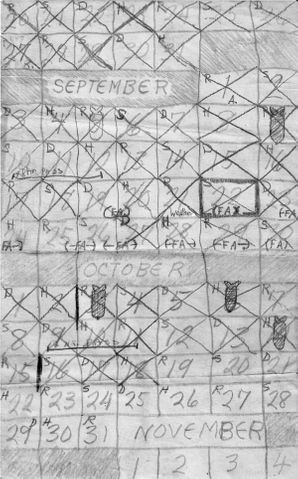 One load list from November 26th, shows most of the crew flying with Lt Wade Jones, who also had become a first pilot after Wagner moved to Squadron HQ. While it is not known for sure, it seems likely that the majority of the crew completed their combat tour of 35 missions at the end of November or beginning of December. Most of the men are listed as receiving the DFC in December 1944. Kermit Wagner was promoted to Captain in January 1945 and left the group that same month after completing his tour. Lt William Purifoy, bombardier, was presumably replaced at some point during Stateside training by F/O Augustine A.Quinzani who was assigned with the crew. 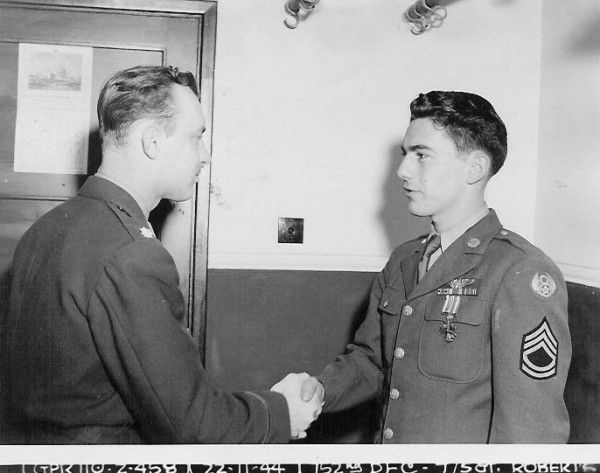 F/O Quinzani was promoted to 2nd Lieutenant in November 1944, went on leave in December, but nothing further is known about his time with the group. 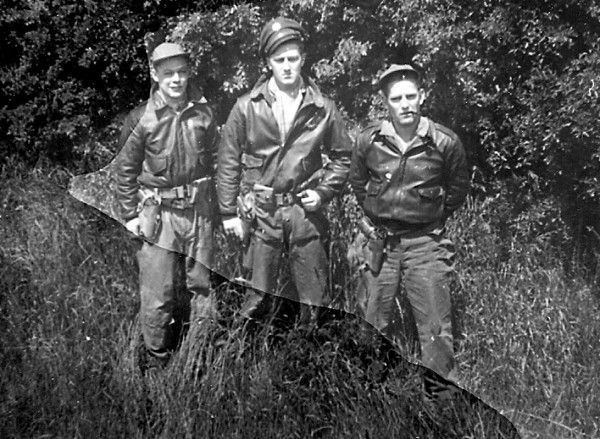 Likewise, S/Sgt Edward Miklaucic seems to have disappeared from the group’s records after the October 23, 1944 transfer. It is assumed that these two men completed their combat tours with different crews. 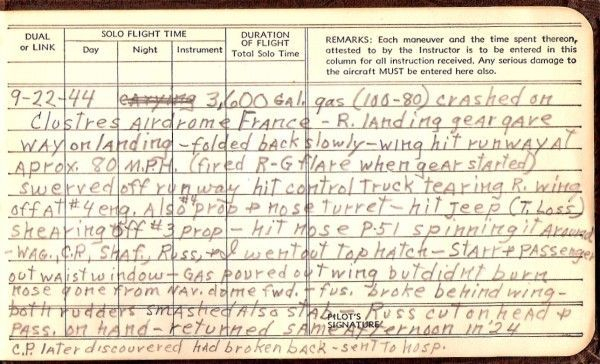 STATEMENT of 1st Lieutenant KERMIT A. WAGNER, Air Corps, Pilot, 755th Bomb Sq, 458th Bomb Gp, AAF 123, APO 558. On 23 September 1944, in A/C 952, on a trucking mission from AAF 123, to A-71, I made a normal approach and landing. Immediately after landing the right wing dropped and I thought the right tire was flat. I tried to hold A/C on runway with the right throttle, and left brake and rudder. At about 50-70 MPH the wing dropped enough to make me realize it was main landing gear failure. The A/C left the runway, and skidded to a stop in the grass, after hitting a P-51 A/C, truck and two jeeps. Injuries were minor and were treated immediately at A-71. The A/C did not burn, but was a total loss. #10 Fr. Troarn (Troop Concentration) 48-100 GP – heavy flak – 3 holes left wing – didn’t drop bombs – ran off end of runway – tug pulled us out of dirt – saw white flak bursts (S. balls) low take off! Abortion – Eisenach oil pump out lost #1 landed wi. Bombs – 12-500G.P. #12 Fr. St. Lo (troop Concentration) 52-100 GP at 12,000 – snowballs – traffic – saw bombs hit also heard – bomber went down 2 chutes – one in bomb area – no bombs dropped short – tho voice on int. reported bombs dropped on run – everyone denies saying so ??? #14 Fr. Belloy (robot bomb site) 24-250 G.P. – undercast – saw no flak – didn’t drop bombs – Schaff. R. gun fired 2 shots L/ rudder – wasn’t called for briefing – just made it. 9-22-44 3,600 gal gas (100-80) crashed on Clustres airdrome France – R. landing gear gave way on landing – folded back slowly – wing hit runway at aprox. 80 M.P.H. (fired R-G flare when gear started) swerved off runway hit control truck tearing R. wing off at #4 eng. Also #4 prop & nose turret hit Jeep (T. loss) shearing off #3 prop – hit nose P-51 spinning it around. Wag., C.P., Shaf., Russ, & I went out top hatch – Starr & Passenger out waist window – gas poured out wing but didn’t burn. Nose gone from Nav. Dome forward – fus. Broke behind wing – both rudders smashed also stab – Russ cut on head & C.P. later discovered had broken back – sent to hosp. #27 Ger. Harburg (20-250 oil ref.) clouds – heavy flak behind us – mew man along today – things worked good. #28 Ger Karlsruhe (4-,2000 GP railyards) -31deg – cloud over target – 1 bomb hung-up – fell through door in Ger. – I kicked door off over FA [France]. – mod. Flak at target – very rough air coming back & rain found piece flak in bomb bay – 1” pic. #30 Fa. Metz (fort in woods 3-2,000 -40deg) ground supp. – ice on wings, engines & tail – still dark at take-off – dropped just over lines – QAM over FA. – rain at field – Almost hit other plane in pattern – saw bombs hit target. #31 Ger. Harburg (12-500 oil ref) -32deg used spare ship – bombs dropped along run – saw one hit AF – our bombs hit highway bridge & city – oil fires – Hydraulic system hit – aileron cables hit – interph. out – gas tank hit – 10 holes – tug dragged us off runway. If you can identify these men, please contact me.